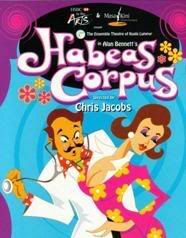 Set in the southern English seaside town of Brighton, Habeas Corpus races along at a cracking pace, dispensing sight and verbal gags as it does so. Bennett’s genius is his ability to portray ordinary middle-class Brits, warts and all, in an amusing and very real way. His characters are beautifully drawn and in the case of Habeas Corpus just a little bit larger than life. The whole thing revolves around the mid-life crisis of Arthur Wicksteed, a family doctor and serial philanderer. (He is the one who is not getting enough). We also meet his long-suffering wife, Muriel, his flat-chested sister Constance and his hypochondriac son, Dennis. Then there is the formidable Lady Rumpers and her nubile daughter Felicity (It is indeed she whose knickers Arthur is trying to get into). Constance is being pursued by passionate clergyman, Canon Throbbing, and the whole shebang is kept in place by the redoubtable Mrs Swabb… the Wicksteed’s maid. Well, how can you NOT watch a play with a character named Canon Throbbing? - good acting from the ensemble cast. Go check it out if you want - it's playing until the 28th of April 2006. Hey, and just so we are clear about this: I have in no way been given any incentive or payment to advertise for them, ok? very useful post. I would love to follow you on twitter. By the way, did anyone know that some chinese hacker had hacked twitter yesterday again.